Which country wins the Olympics? Right now China is in the lead for most medals (73: 34 gold, 21 silver, 18 bronze) and most golds. The USA is second in both categories (71: 30 gold, 19 silver, 22 bronze). In 2008 there was some controversy about whether the ranking should be done by largest total number of medals or largest golds; here’s the table from Wikipedia. If I recall correctly (though it’s surprisingly hard to search for this) non-Americans were saying that the “right” way to do it is by golds, but Americans insisted on doing it by total medals. Not surprisingly the USA had the most total medalists in ’08 (110, to China’s 100) but not the most golds (36, to China’s 51). But it hardly seems fair to expect, say, France to get as many medals as the USA, simply because they have about one-fifth the population. Shouldn’t their 41 medals in ’08 count for something? In fact they beat the US on a per-capita basis. In the current (2012) Olympics, as of two days ago Slovenia led the medal table per capita, says the New York Times. (This actually isn’t a case of a small country winning one medal; the Slovenes, at that point, had four medals for their two million people.) Medals per capita has up-to-the-minute data; as of this writing New Zealand (one medal per 443,262 people) has pulled ahead of Slovenia, and Grenada (110,821 people; one medal) is in the lead and is quite likely to stay there. Historical data is available as well; since 1984 it’s always been a very small country in the per-capita lead. But per-capita counting is probably a little bit too aggressive in adjusting high-population countries downwards, because there are some events that have a limit in number of competitors per country. Team sports come to mind; there’s no way the USA will win more than two medals in basketball, despite its dominance. (Of course I’m trying to prop up the USA here! The site’s creator, Craig Nevill-Manning, is a New Zealander.) We could do regression to determine how many medals we’d expect a country of a given size to win, and then judge countries relative to that benchmark. So here’s a way to put a partial order on countries: country A is “better” at the Olympics as country B at the Olympics if A wins more medals than B and has smaller population. 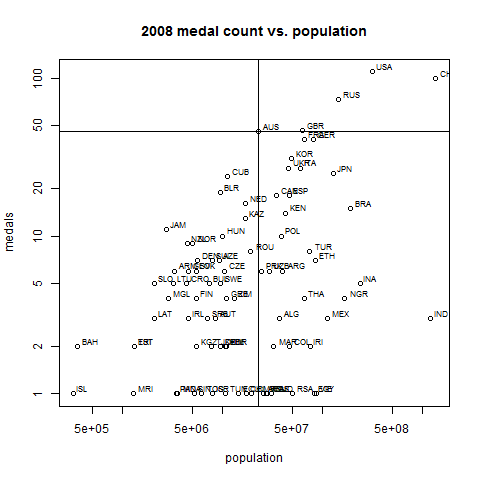 We can plot the medal counts in a scatterplot — see below. The “winners” of the Olympics — and there are many — are all the maxima under this partial order, that is, all the countries for which no smaller country got more medals. Winners therefore include the lowest-population country to win a medal — in ’08, that was Iceland — and the country that won the most medals — that is, the USA. Intermediate between them, in 2008, were the Bahamas, Jamaica, Belarus, Cuba, Australia, Great Britain, and Russia. On the scatter plot below, these are those countries for which, if you draw a vertical line and a horizontal line through the point representing them, there are no points in the upper left quadrant; I’ve drawn those lines for Australia. So far in 2012 the leaders in this category are China, the USA, Great Britain, Australia, Romania, Hungary, Slovenia, Estonia, and Grenada. (But don’t read too much into the differences between these lists, especially at the small-country end; during the Olympics such a list will be biased towards countries that happen to be good in events that happen early on.) I’ll put out the final results once the Olympics end. Edited to add, 12:29 pm: in this 2012 New York Review of Books article on the pursuit of medals, I found a link to this 2008 Wall Street Journal article on differing schemes of ranking countries, namely the gold-versus-total-medals debate. Previous Post What are mathematicians? These guys are usually called Pareto winners. Well, that name makes sense. Reductio ad absurdum: The USA has 314,000,000 people. Grenada has 105,000 people. The population of the USA is 2990 times the population of Grenada. There are 302 Olympic events this year. Grenada has won one gold medal. Even if the United States were somehow to win all other gold medals (301), Grenada would still be ahead of the US in this year’s per capita medals standings. In fact, if the United States were to somehow win all 302 gold medals in the next eight Olympics along with its 301 in this Olympics, Grenada’s single gold medal would have more weight per capita than the USA’s 2715 golds. If you think the USA is doomed by it’s large population, imagine how China feels in the per capita standings. With 4 times the population, they’d have to go back in time and win every medal every won in order to compete with Grenada’s single gold medal. First, that an increased population gives a benefit on a curve, or said differently, each milllion added to a country’s population gives a smaller return on medals than the previous million. Olympic rules that cap the number of participants on a team: US olympic trials are often a matter of hundredths of seconds, knocking out potential medals winners whose performance might have peaked during the actual games. Jordynn Wieber could tell you all about how the gymnastics rules, meant to keep one country from dominating, kept last year’s world champion out of the all arounds, despite having a better score than 21 of the 24 finalists. Second, Team sports, that require a disporportionate number of players to possible medals: There are 12 players on a basketball team, but only 2 medals available for men’s and women’s basketball. Each player on the team receives a medal… what if we included all 24 members of the teams in medal counts?What if we counted all participants in relays, gymnastics teams, water polo, women’s soccer, volleyball, rowing, etc. These sports require a higher degree of manpower, or population participation to win a medal. If you are going to make it a matter of population, shouldn’t the number of athletes required to win a medal be considered as well? I would be interested in looking at a slight variation on your method described above. Almost everyone agrees that the four ways to ‘win’ the overall medal count are to have the most gold medals, to have the most medals, to have the highest ratio of medals per capita, or to have the highest ratio of gold medals per capita. Create new plots of population versus those four y-values for each country and use your method to calculate a list of winners. I’m guessing there will be about 20 countries which will claim victory along one of those dimensions leaving billions of satisfied people around the world. It would also be interesting to normalise results with respect to potential medals/athlete. Currently in example one swimmer can realistically win several medals, but in some other sports athelete can realistically attend only one competition. The Olympic event distribution is not uniform. The wrestling discipline has 18 events (and 18 triples of awarded medals), while Archery has only 4 events. The performance of countries tend to be very heterogeneous among different disciplines. Hence the number of medals is not a good indicator of the overall achievement of a country in the Olympics, even if you couple that with population size considerations. Joni and Akashnil: I agree with your comments. And indeed some of the countries that perform very well in this adjusted medal table win a lot of medals in sports that are relatively generous with medals (Australia in swimming, Cuba in boxing). But taking apart the medal counts and making such judgments seems too much like work. Have you thought about making a classification based on financial investment for the olympics, globally or in each sport: how many (perhaps weighted, like 5/gold,3/silver,2/bronze, or 4,2,1, or whatever weights experts feel like) medals per money invested? Related to this, I would be interested in knowing how much of their GDP each (of the usual top 10 say) country usually invests into preparing athletes for the OG. And how much the home country usually invests, perhaps only partially counting infrastructure building (that contributes to athletes’ training but I couldn’t say how much). How much a gold medal is worth on average, etc. I think the investment aspect must reveal alot about countries, about peoples. Thanks alot for the great blog. There’s a wonderful book entitled “Towing Icebergs, Falling Dominoes, and Other Adventures in Applied Mathematics” by Robert Banks that has a chapter entitled “A Better Way to Score the Olympics.” It combines population with economy. It’s quite revealing. He moves from there and the metrics he develops to “How to Calculate the Energy of a Nation.” There’s so much of interest there that I strongly recommend getting and reading the book.